An unnerving number of the population has or is currently experiencing problems with greasy hair. This comes to some, even after washing their hair every day. There are a few different solutions that can be tried to reduce the oily appearance of your hair. If you’ve had this problem before, try these solutions and attempt to remove the greasy look from your hair. If this doesn’t work, don’t give up, keep experimenting with solutions until you can find one that works for you. Sometimes you just can’t help it. Genetics may be to blame for your unwanted look. Most teenagers at some time will experience embarrassingly greasy hair. Adult women may have the same problem in relation to their menstrual cycle. The texture of your hair can be one of the biggest factors in determining how greasy your hair will look. Those with thin fine hair will find their hair looking oily well before those with thick coarse hair. Look into these factors to determine what is causing your hair to appear greasy, then look for the best possible solution. It is healthy to wash your hair only every other day or so, but if your hair is greasier than normal, it may be time to start shampooing every day to see if it makes a difference. After using both shampoo and conditioner, make sure it is thoroughly rinsed out. The residue from this will make your hair greasier. By over brushing your hair you will bring the oils down through your hair, only adding to the greasy appearance. This is also true for excessively running your fingers through your hair. Doing this in a diluted tea will help reduce some of the oils that are present. Make sure not to do this too often to avoid drying out your hair too much. There are a number of solutions that can be looked to for those with greasy hair. Make sure to find the one that works best for your hair. Although some oil is necessary for healthy hair, too much can be embarrassing. These simple greasy hair remedies can help make your hair less greasy and maybe get rid of greasy hair altogether. Depending on what the cause of your oily hair is, there may not be a way to permanently get rid of oily hair. If this is your case, don’t fret. There are numerous ways to style greasy hair in a way that it looks like your hair isn’t oily. If you’re rushed in the mornings or you simply don’t feel like messing with the styling of your hair, a quick brush and a headband or scarf is all you need to head out the door. No clips, pins or hair product needed. You already do a messy bun on those days you don’t wash your hair. With a Hun, the already easy, no-fuss process of putting your hair in a bun is now even easier. Adding dry shampoo to this topknot will add thickness and volume to the hair. Hair clips, especially claw clips are your best friend if you struggle with greasy hair. A quick and easy twist, bun or half bun is all you need to have a clean, classic look that hides the oily hair due to improved height and texture of your hair’s roots. By allowing the hair to part naturally down the center of the top of the head is off-limits to those with greasy hair as this center part exposes and emphasizes the greasy, dirty look of oily hair. Instead, try parting the hair to the side. Not only will the excessive oil be hidden, but the hair will appear thicker. Braiding the hair on the top of your hair in a halo is a great way to have a fun, unique, elegant look while also hiding your oily hair roots. Dutch braids are similar to French braids, only there are two twin braids on either side of the head. Make sure after you braid the hair to loosen the plaits a little. The loose look will give a softer appearance and disguise the greasy hair. While you’re trying remedies to get rid of greasy hair, you may also realize that you also have dry, split ends. Having the double whammy of oily roots and dry ends is a common struggle for many men and women, especially those with long, coarse hair. Split hair doesn’t look great and can be a sign that one’s hair isn’t as healthy as it could be. For hair to grow longer and thicker, regular trimming is necessary. Excessive split ends can indicate that you’re due for a trim. With hair care products becoming more sophisticated and effective for treating specific conditions, there are now special shampoos available that cleans dirty, greasy scalps while also utilizing proteins to provide conditioning for the dry, split ends of hair. Look for a hair conditioning product that cleans and reduces sebum fat (the source of excessive scalp oil). With its moisturizers, it will also strengthen and bring back dry, split ends. Greasy hair isn’t something anyone wants. There are multiple greasy hair causes including heredity and excessive hair brushing. Fortunately, there are many easy, at-home greasy hair remedies that can get rid of greasy hair. If one can’t permanently eliminate one’s excessively oily scalp, there are ways one can style greasy hair that hides the oily roots while also giving the hair height and volume. The combination of an oily scalp and dry, split ends are a common problem many with long hair experience. Using special shampoo and conditioners can help treat both these conditions simultaneously. At Taylor Andrews, we understand the struggle and the work involved in maintaining healthy, beautiful hair. 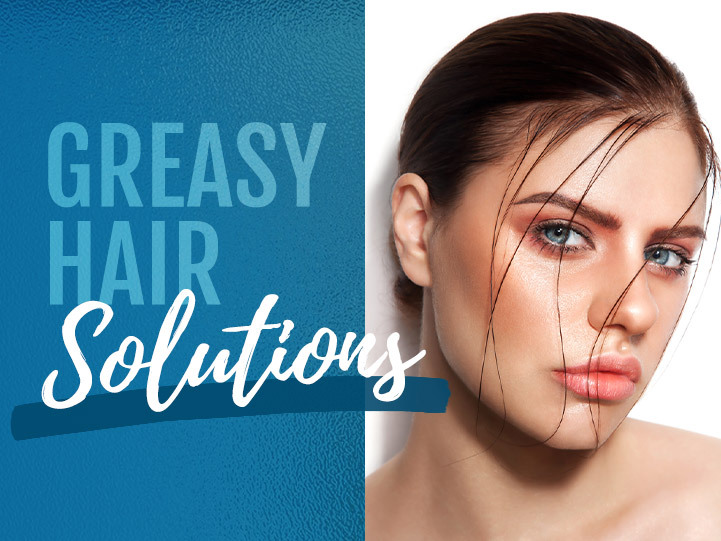 Our hair professionals would be happy to give you that perfect hairstyle that helps you look your best while combatting greasy hair and split ends. Contact us today to schedule an appointment.